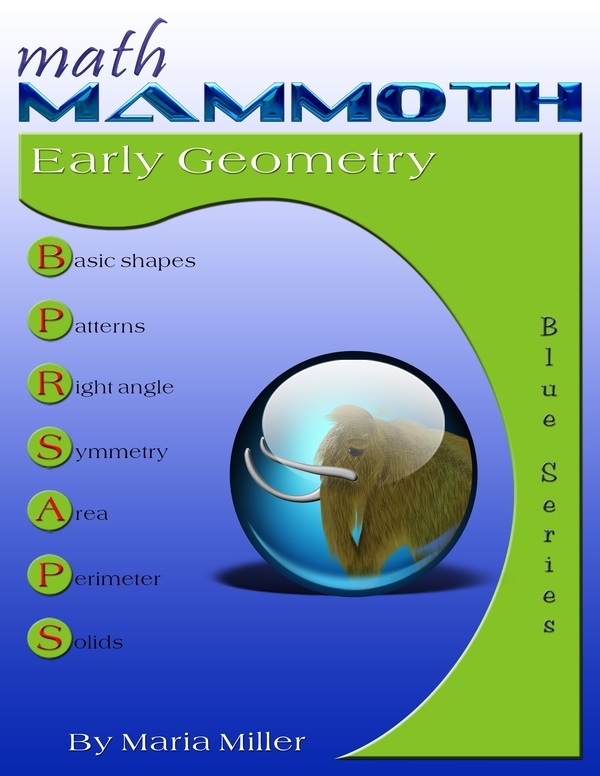 Math Mammoth Early Geometry covers geometry topics for grades 1-3. The first lessons in this book have to do with basic shapes—that is where geometry starts. Children learn to recognize and draw basic shapes, and identify triangles, rectangles, squares, quadrilaterals, pentagons, hexagons, and cubes. They also put several shapes together to form new ones, or divide an existing shape into new ones. We also study some geometric patterns, right angles, have surprises with pentagons and hexagons, and make shapes in a tangram-like game. These topics are to provide some fun while also letting children explore geometry and helping them to memorize the terminology for basic shapes. The students also learn a little about symmetry and mirror points—two hopefully easy and fun topics that tie together. In the latter part of the book, the emphasis is on two 3rd grade concepts: area and perimeter. Students find perimeters of polygons, including finding the perimeter when the side lengths are given, and finding an unknown side length when the perimeter is given. They learn about area, and how to measure it in either square inches, square feet, square centimeters, square meters, or just square units if no unit of length is specified. Students also relate area to the operations of multiplication and addition. They learn to find the area of a rectangle by multiplying the side lengths, and to find the area of rectilinear figures by dividing them into rectangles and adding the areas. We also study the distributive property “in disguise.” This means using an area model to represent a × (b + c) as being equal to a × b plus a × c. The expression a × (b + c) is the area of a rectangle with side lengths a and (b + c), which is equal to the areas of two rectangles, one with sides a and b, and the other with sides a and c.
Multiplying by Whole Tens is a lesson about multiplication such as 3 × 40 or 90 × 7. It is put here so that students can then use their multiplication skills to calculate areas of bigger rectangles. Then we solve many area and perimeter problems. That is necessary so that students learn to distinguish between these two concepts. They also get to see rectangles with the same perimeter and different areas or with the same area and different perimeters. This book is also suitable for a geometry notebook or journal project. This simply means that for each new TERM in the book, the student explains that term and draws the corresponding figure, using 1-2 blank pages. In the end, the student will have his/her very own geometry book to keep and show around! 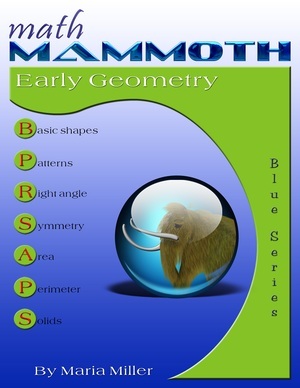 After studying these early geometry lessons, you can continue the study of geometry with Math Mammoth Geometry 1 book.